The "den-mother" who hadn't appreciated my shirtless running left the Peace Run after a month. She was quickly replaced my my actual mother. I hadn't been in close contact with mom for some time. Not because of any past conflict or anything -- I just hadn't been all that close to any family members since moving to New York a few years earlier. But with Jeevan and Nirbachita now in the Center that began to change. While I think both of them were still members of the San Francisco Center, they were making weekly trips south to Santa Cruz in an effort to re-establish a Center there. Coincidentally, that's also where my mom was living. For that reason, I think, mom slowly began getting more and more involved in Center-related activities. When it became clear to us on the run that we needed someone to join the team who had some cooking abilities, my mom's name surfaced -- I'm not sure how. I just remember Shambhu calling from New York to ask me if I'd mind having my mom on the rest of the run with us. I said it would be okay and as the run entered the Southwest, mom joined the team. Almost immediately we had a shout-fest right out in the open (because I had been too lazy to do some chore she had asked me to do). But after that -- after we had both marked our respective territories as it were -- things seemed to be fine. As much as I had loved the Southwest, I was ecstatic as we passed through the Californian desert and reached the Pacific Ocean in San Diego. First stop: the Clam (where we had gone on Peace Run '87, too). Later, as the run turned north up the California coast it really felt to me like home. And we had so many California disciples ready and willing to run with the torch, I got some time off and actually drove up to Morgan Hill -- to my dad's place -- with Durdam (whom I'll have more to say about shortly). Psychologically, therefore, it was difficult for me as the run passed through Oregon and Washington and then turned east for the slow slog back to New York. One incident in particular illustrates both my building frustration and my realization that I had been right in telling Guru that my hunger for the Divine wasn't going to return; I wanted out. It happened one evening somewhere in the Midwest. For some unavoidable reason -- injury or mechanical breakdown or something -- the team couldn't meet its mileage goal for the day. The afternoon crew came up short, so Arpan asked me if I'd skip dinner and go out with him and bang out an extra eight miles between the both of us so that we wouldn't get behind. We had both already run our allotted 10-12 miles earlier in the day, but it was important that the team as a whole didn't start falling behind on our schedule, so we stepped up. Arpan's plan was for us to leap frog each other. Typically on the Peace Run there was only one runner running at a time -- it was a relay after all. But in this situation, Arpan felt -- and I agreed -- that we should just get the mileage done as quickly as we could so that we could get back to base, get dinner, and hit the hay. 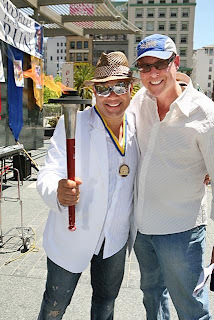 So, once we found the spot where the afternoon crew had finished earlier in the day, Arpan dropped me off with a torch. He said he'd give me a bit of a head start, and then drive up about two miles and park the car. From there, he'd start running. Once I got to the car, I'd drive past him a set distance, park, and start running another leg. In this way, we could crank out the eight additional miles in pretty short order. The problem? It was dark, the road was curvy, and I was fatigued. On my first leg of running, I couldn't find the car. I ran for 20 minutes: no car. Two miles shouldn't have taken more than 15 minutes. So, I doubled back for 10 minutes, thinking that perhaps I had unwittingly passed the parked car. No dice. I blew my stack. "Goddammit," I yelled to the dark countryside. With all my might I slammed the torch -- custom made and relatively expensive -- into the pavement. It was destroyed and I flung it into the bushes alongside the road. All my pent-up frustration with being back in the Center -- my growing, yet unquenchable, desire for a girlfriend -- all came out at that moment. Why had I come back to the Center? I was tired, hungry, and frustrated. As I turned around and began walking slowly back in the other direction, I was sure. Once back in New York, I would have to leave the Center after all. I had to get out. I was feeling emotionally claustrophobic and the confinement of life on the road on the Peace Run just exacerbated that feeling. Before I could do anything, however, I had to find the car. I found it a short while later, just a hundred yards beyond where I had originally stopped running. By the late summer, the Peace Run concluded back in New York. The rest of my journey east was much better. The lost car incident had been the low point for me. But the realization that I'd have to leave the Center in the near future was as clear as ever. 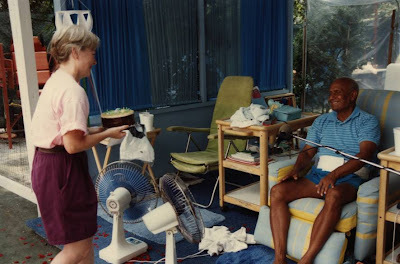 Nevertheless, it was with great relief that I found myself back in New York, back at the tennis court, and back with Guru -- back around familiar surroundings and off the road. 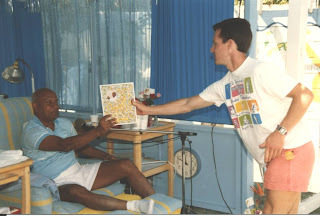 The picture above shows Guru at the tennis court just before the start of the August Celebrations handing me a custom, made-by-Sanatan, plaque, commemorating my participation on the Peace Run '89. During Peace Run '89, I saw and felt so much. I wish I had kept a journal. Over the next three and a half months, I'd touch foot in each of the 48 contiguous United States, average about 10 miles a day of running, enjoy wondrous highs, and suffer frustrating lows. My time on the Peace Run was an invaluable experience on every level which would ease my eventual transition from the Center to civilian life. The course we embarked on took us south and then west on a serpentine course designed both to touch major population centers and to cross into each nearby state along the way. The runners, generally, were divided first by the sexes -- there was a boys' team and a girls' team -- and then again by either morning or afternoon crews. Arpan was the overall leader on the ground and for at least the first month or so a middle-aged woman disciple played den-mother for the girls' team. Throughout the summer, there were typically about a dozen runners -- guys and girls combined -- on the run at any one time. About six of us were on the run from beginning to end, while the rest of the team members were made up by disciples who would meet up with the run for varying lengths of time, sometimes a week or two, sometimes a month or two. As a whole, we typically covered more than a hundred miles a day in relay fashion. Thus, when there were fewer disciples supplementing our core group of runners, we had to run further each day (and vice versa). Oftentimes, members of the the public also helped. One of my favorite of these moments was having a small group of Navajo teenagers pull up alongside us in either Arizona or New Mexico as we ran through their territory. Part of a fledgling cross-country team, they took turns clicking off the miles in that barren, magical landscape, holding the peace torch with a reverence that I had long since traded for familiarity. As runners, we were just the most visible part of the Peace Run. Coordination of the run's public relations events -- ceremonies and press contacts -- were coordinated by Shambhu and his assistants in New York. One young woman who deserves special praise is Lahiri. Originally hailing from the Chicago Center, Lahiri had moved to New York at more or less the same time I had. Behind the scenes, she (and I expect others unknown to me) worked tirelessly to arrange lodging for the runners at hotels along our route each night. Thanks to her effort, we spent 85% of our nights sleeping in hotel rooms rather than camping at KOA camps or RV parks. That made all the difference in the world to me, and was critical to my already shaky morale. I did find the run liberating, if only because I was out of the city. I was out on the road, running big mileage, and breathing fresh air everyday. But even on the Peace Run, I couldn't completely escape the annoying scrutiny of some eager beaver disciples. 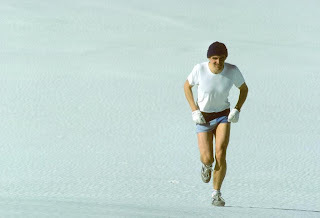 For example, I loved to run shirtless (as you can see in the photo above). This drove the girls' team leader -- a middle-aged mom comfortable ordering boys around -- crazy. She confronted me about it and "asked" me to wear a Peace Run shirt whenever I was running. I ignored her. The next time she saw me running shirtless, she complained to Arpan and threatened to call New York (i.e., complain to Guru about it). Arpan was sympathetic to me. I only took my shirt off in the countryside, but I was making his already difficult job even harder. So, I kept my shirt on (unless it got really hot!). In any event, I had no intention of breaking any of Guru's rules. And, as an important aside, I was still "master of my domain!" On the morning of my first day of work at Victory Factory, I met the guys -- Abedan, Sudhir, Sandhani, and the other workers -- at the Smile. From there they regularly car pooled from the block in Jamaica to Hollis (home of Run DMC), where Victory Factory was located. I felt very self-conscious stepping into the Smile. Sahishnu -- already backed up with breakfast orders at the grill -- acknowledged me with a look. I don't remember ordering anything; I just sat there feeling strange and waiting for the ride to my new job. In later years, Trishatur would play a significant role in my own formal education, but at the time of my move into his apartment, it was simply his acceptance of me that meant the world. I was just beginning to settle into a routine of waking up late, exercising and working half days at the Factory, when Shambhu approached me with an idea. How would I like to join the Peace Run's full-time crew? Peace Run '89 was set to embark on a 50-State relay run in just a couple of weeks. Shambhu said that the team -- which was to be headed by Arpan again -- needed another solid set of legs and that I wouldn't have to worry about my expenses. He'd take care of it. 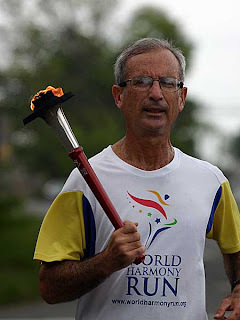 Shambhu was the brains and driving force behind the Peace Run (which in its current incarnation is known as the World Harmony Run). To me, though, Shambhu was more than that. He'd always taken an interest in my development. While his team could surely use another set of dependable legs for the upcoming run -- which would last about three and a half months -- I felt at the time that Shambhu's generous offer was more about getting me out of the city and giving me room to grow. I was (and am) grateful for the offer and immediately accepted. A short time later, I found myself in a van emblazoned with the Peace Run '89 logo heading south out of Manhattan on what was to be an eventful summer. Great shot above of Shambhu and Narada in San Francisco as the World Harmony Run '08 passed through. See some of Shambu's other great photos on his Flickr site here. Frankly, I felt like damaged goods. I had fallen from grace and it was out in the open for everyone in my disciple-centered world to see. Whatever status I had been afforded in the eyes of my brother and sister disciples as a consequence of having come to the Center young, having been one of Guru's ball boys at the tennis court, having helped with Guru's musical instruments, having associated with the "inner circle" of Guru's closest disciples, or my personal mythology -- all of that was shot. Surprisingly, however, the loss of my spiritual bona fides -- my disciple street cred as it were -- was liberating. True, I was back in New York -- back in the Center -- out of a sense of obligation to Guru rather than a personal desire to be there. But I was much more free than I had been before. For one thing, I no longer worked at the Smile, where for the previous three years I had had just two days off each month. Now, I was happily unemployed. Nor did I any longer feel obligated "to be available" -- whether to throw tennis balls for Guru at the court on weekends or to receive calls inviting me to Guru's house during the week. I was only obligated to show up to the public meditation on Wednesday nights and my Center meeting on Sunday nights. Other than that -- and helping Vinaya transport Guru's instruments to and from concerts -- I didn't have to be around. I was also freed of any false sense of friendship. While I received no overt snubs from anyone, I sensed -- perhaps wrongly -- a general feeling of aversion to me from many in my former circle of friends. Like I was contagious. Conversely, a small group of guys really stepped up and embraced me, forging instant bonds of friendship that remain with me today. First among them was Sudhir. I knew about Sudhir before I actually knew him. In the wee hours one fall night in my early years as a New Yorker, Databir had told me a story about Sudhir. It was past midnight and we -- Databir, Bipin, Ketan and I -- were way out Union Turnpike touching up the paint on one of Guru's many running routes throughout the borough. We were the latest incarnation of Guru's "road crew." Guru had running courses all over Queens. 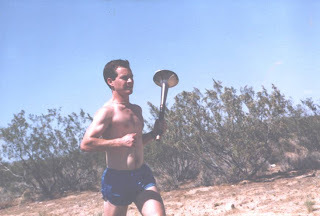 In the late 1970s, after taking up long distance running, he had the original road crew measure out numerous running routes of various lengths with a measuring wheel. Guru not only wanted the mile markers painted visibly on the street, he also wanted markers every hundred yards! So, the road crew painted "100", "200", "300", and so on, from the beginning of each course to the end. And these courses could be ten miles long or more. It could be brutal work, particularly in the winter. The hundred yard intervals, for example, were painted in white with the numerals measuring about a foot in length. Then the whole number would be circled in white paint. Running down the street, it would be difficult to miss these huge, hand-painted numbers every hundred yards on both the street and adjacent sidewalk. And that was the point. The actual mile markers were painted even larger than the hundred yard markers. There were also stride marks to paint. From time to time, Guru would want to work on lengthening his running stride, so he'd have the road crew paint stride marks on the sidewalk every 36 inches or so (I don't remember the exact measurement). Obviously, the road crew had no authorization or permit from the City to be painting up the borough's sidewalks and streets, but trouble was rare. Aside from a few irate homeowners, nobody seemed to care. Once, for example, a police car pulled up behind us as we were painting a street in the middle of the night. Because I had always felt comfortable talking to cops (having been raised by one), I walked right up to them and explained that we were marking a 10K course for an upcoming race. One of the cops asked me what outfit we were with. "Alley Pond Striders," I responded instinctively. That was it. They got back into their squad car and let us have at it. That was road crew. It was fun to be out with the guys doing something for Guru, but it was always done very late at night. Since I usually had to be at work by 8:00 a.m. -- unlike the other guys -- I sometimes got a little cranky. That's when Databir told me about Sudhir. Back in the day, before I'd come to New York, Sudhir had been part of Guru's original road crew. While he had once worked at the Smile -- one of my predecessors there -- Sudhir spent the rest of his time serving Guru. During one stressful period of time, however, Guru began firing members of the road crew, one-by-one, until the road crew consisted only of Sudhir. In the early morning hours of a cold winter night, Sudhir found himself on 150th Street chipping away ice by himself so that he could then paint an interval marker. It was then that Sudhir broke down, unable to go on. At that moment, Guru walked up and told Sudhir to go home. That's the story as Databir told it. Up until that point, Suhdir had been a made man. 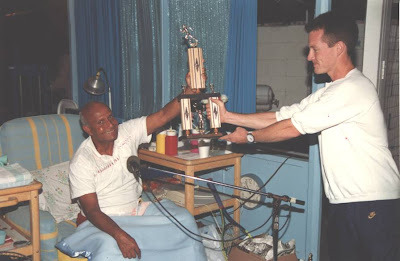 In the days before Guru owned his own tennis court (which was called "Aspiration Ground" and which now serves as Guru's burial spot and "samadhi"), Sudhir was in charge of taking Guru's tennis net to Jamaica High School and setting it up at Guru's request. After his "fall," however, Sudhir was damaged goods, just as I felt I had become after returning to New York from my unsuccessful escape attempt. Sudhir -- perhaps recognizing my predicament -- suggested that I come work at Victory Factory, where he was the shop foreman. Victory Factory was owned by Abedan and it produced silk screen frames for commercial and industrial use. It was perhaps the only disciple-run enterprise in the United States that paid its employees a decent wage. With Abedan's generous approval, I worked at Victory Factory for the rest of my time in New York (which as it turned out would be something just short of another year). During that time, I grew to appreciate Sudhir's dry wit and cynical -- one might say realistic -- sense of humor. Because Victory Factory paid so much more than the Smile, I found that I only had to work half-days to pay my meager bills. Stressed from the emotional roller coaster I had been riding for the past couple of months, I took advantage of this situation and slept in every morning. As my boss -- and at a time when I needed it most -- Sudhir was solicitous of my need to keep irregular hours (as was Abedan). 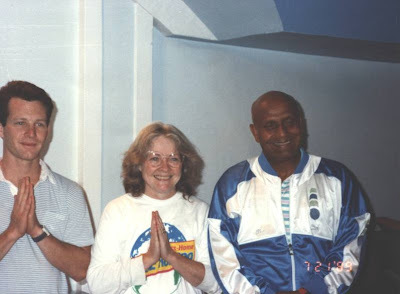 As I'll discuss in a later post, in the years after my final departure from the Center, Sudhir became the only person -- outside my brother and sister -- with whom I could discuss spiritual matters in a consequential way. What a great shot of Sudhir taken by Unmesh. Check out some of Unmesh's other fine work here.